China launched a satelliteWednesday to begin a three-year mission surveying the world's oceans to monitorsea color and temperature, according to state media reports. The Haiyang 1B satellite isChina's second oceanographic satellite,and it replaces an earlier craft that stopped working in 2004, according to theXinhua news agency. Liftoff of Haiyang 1Boccurred at 0327 GMT (11:27 p.m. EDT Tuesday) from Taiyuan launch center innortheastern China's Shanxi province, Xinhua reported. A two-stage Long March 2Crocket deployed the payload into orbit a few minutes later, completing China'ssecond space launch of the year. The flight of the 138-foot-tall booster markedthe Long March rocket family's 54th consecutive successful mission since 1996. Haiyang 1B was delivered toa Sun-synchronous orbit circling Earth's poles. This type of orbit allowssatellites to fly over much of the planet at set intervals. The craft is the secondocean surveying satellite fielded by China, and its mission will includepushing Chinese development of ocean resources, aiding the construction of newharbors and ports, and monitoring ocean pollution, according to Xinhua. China's first ocean studiesspacecraft was launched in 2002 and prematurely ceased operations less than twoyears later. Engineers added upgrades to Haiyang 1B to increase its lifeexpectancy, sharpen its imagery, and update its software, said a Chineseofficial in a state media report. The previous craftconducted extensive studies of regions in the Yellow Sea, the East China Seaand the South China Sea, according to the People's Daily newspaper.Reports provided no details on likely focus areas for the new satellite. After Wednesday's launch,officials announced plans to develop and launch five more oceanographicsatellites in the next few years. An updated craft could launch by 2009, andeven more advanced ocean surveillance satellites could follow in the nextdecade, according to Xinhua. The launch was the secondof the year for China's space program, and the 10th space launch tosuccessfully reach orbit in 2007. 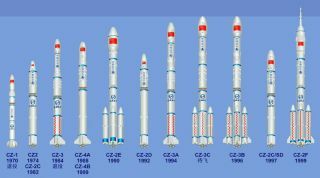 China plans more than ahalf-dozen additional launches this year to carry government and commercialsatellites into orbit. China will also send its firstlunar orbiter to the Moon in a launch planned for this fall.